Beer. Golf. TV. Mowing. Burping. Fishing. According to greeting cards in the store aisles, this is all that modern fathers care about. Father’s Day is clogged with lowbrow stereotypes. Dad just wants to hog the remote control, crack a few crass jokes and drink a cold one. He’s not nurturing, caring or involved. He’s not devoted to his wife, children or grandchildren. But think about the fathers you know. Chances are they defy such silly typecasting. They’re washing dishes and changing diapers. They’re sacrificing to pay for college or moving to be near grandkids. Many men today are redefining what it means to father. They are intimately involved in the raising of children and the responsibilities of family life, navigating the competing demands of work and home with love. How can we as a church support their callings? What sources of inspiration in our Catholic tradition offer ways to honor fathers? Scripture holds tender images of fatherhood. Moses reminds the Israelites that God is both fiercely protective and faithfully nurturing: “The Lord, your God, who goes before you, is the one who will fight for you, just as he acted with you before your very eyes in Egypt, as well as in the wilderness, where you saw how the Lord, your God, carried you, as one carries his own child, all along your journey until you arrived at this place” (Dt 1:30-31). This Father’s Day, let us lift up the love of fathers. Just as Mother’s Day calls us to widen our prayers to include all who mother, let us pray for fatherhood in many shades and hues. Men who long to be fathers. Fathers who have lost children. Children whose father has died. All whose father was absent. Fatherhood deserves to be supported with words of love and gratitude. In contrast to the typical Father’s Day cards, Brother Mickey McGrath, of the Oblates of St. Francis de Sales, paints lively, loving depictions of St. Joseph with Jesus: feeding the baby in his workshop, holding the toddler Christ on his lap, backpacking to Jerusalem with teenage Jesus. Colorful, imaginative portraits that bring to life the affection of fatherhood. 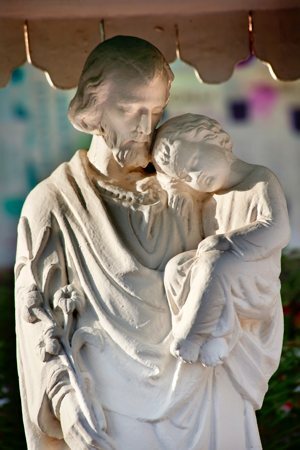 Next to our sons’ toothbrushes in the bathroom sits a card with one of these images of St. Joseph: sitting in a rocking chair, soothing the Christ child to sleep. Years ago I placed it there in the hopes it might be a quiet reminder for our boys — just like their father’s tender love for them — of what fatherhood means: everyday rhythms of love and duty, sacrifice and joy. If our sons are called to become fathers, my prayer is that their church will nurture them just like this: in prayer and sacrament, through Scripture and saints, with honor and hope. The same ways we can support fathers today.